If we don't understand our history, we cannot prepare for our future. 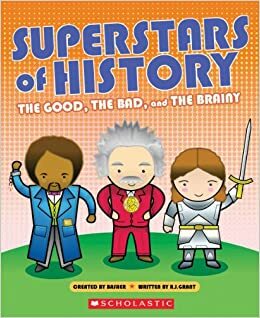 In Basher and Grant's new book, history is laid out in a clean, simple format with all of the important information children need to know. Heck, I could honestly see me using this with some of my lessons in my high school English class. The book is thoughtfully laid out, with four main categories: The Ancient World, The Middle Ages and the Renaissance, The Revolution and The Englightenment, and The Modern Era. Each section begins with an overall timeline and brief overview of each figure. Then, each historical figure gets his/her own time to shine with a beautiful illustrated avatar and quote/important information as well as a clean layout that includes: a timeline, a summary/overview of the figure written from a first person point of view, his/her legacy, a question and answer bubble, and other important information. Children ages 8-12 will enjoy the straightforward way that Basher and Grant present the information with colorful and creative shapes and designs.